For Cafeterias, Quick Service, Concessions, Ice Cream / Frozen Yogurt Stands, Hamburger Sandwich, Pizza, Coffee, Bakery, Deli’s, & Bars. There are 50 large rolls in each case of paper.Fits many cash register models including:.. 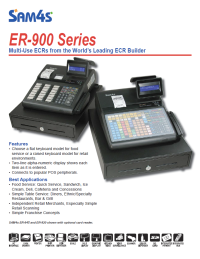 Replacement Insert Tray Cash Till for the Sam4s ER-900, SPS-300 and SPS-500 Series Cash Registers. &.. Replacement Insert Tray Cash Till for the Deluxe Drawer Upgrade of the Sam4s ER-900, SPS-300 and SPS.. Optional SD Card for the Sam4s ER-900, SPS-300 and SPS-500 Series Cash Registers. Fits the fol.. Spare Keyboard Overlay for the Sam4s ER-900 and SPS-300 Series Cash Registers.Fits the following mod..